Emily looks cozy and cool in this textured ensemble, doesn’t she? When I go shopping at Goodwill, I take into consideration not only how an item looks, but also how it feels! She’s wearing this gray-and-white Joseph A. sweater that was $7.99. It’s so soft to the touch with a fuzzy texture and fun polka dot vibe. With a statement sweater like this you don’t need to do much more than throw on your favorite pair of jeans like Emily did here! For extra drama, I also added another layer of texture with the infinity scarf, also in gray faux fur, that was $3.99. Her simple tennis shoes are her own and lend an air of casual comfort to the overall look. Always go for items that feel good to the touch and bring a smile to you and those who see you. Matt knows that layering is the way to go with the fluctuating temperatures of wintertime. Having some great, but simple pieces can turn any casual look into fashion with flair. We started with a graphic t-shirt from Salvage that was $4.99 and topped it with a Merona brand sweater that was $5.99. The red/burgundy tones are perfect for winter and a great foil to the black of the t-shirt. Goodwill is a great place for denim, as illustrated by the medium wash Land’s End jeans Matt is wearing here. His own rugged hiking boots keep it all grounded. Just to spice it up we threw on a European-style scarf from Eileen Fischer for $4.99, and some fashion sunglasses that were $2.99. 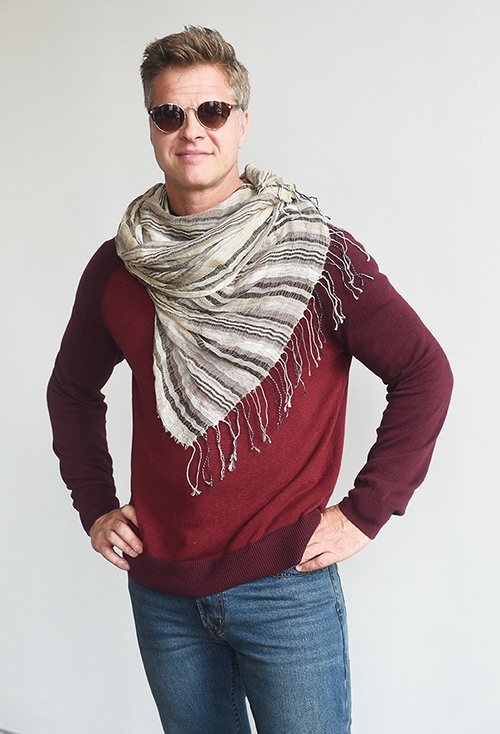 American men are a little reticent to wear scarves sometimes, but I say face your fears and get some stylish gear like this to bring out your inner rockstar! No matter what, Matt is confident AND fashionable in this easy to do look.